The Windsor 84 Wooden Lean-To Greenhouse is a fantastic lean to greenhouse that just has a very charming personality. 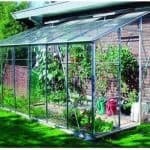 This is a good sized greenhouse that will stand with pride against your house or even shed. 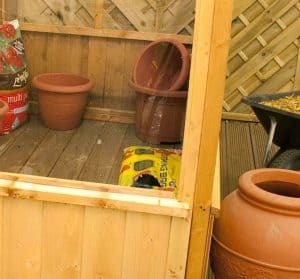 It is a very decent size with plenty of room for you to potter around looking after your food and tending to your plants. The headroom offered is just ideal and even tall people will not have to be hunched over inside of here. Keeping your food and plants safe is a door that comes with a lock and key. For those days when the sun is really beating down, there is an air vent which can be opened and let in a good flow of air. This is a very well made lean to greenhouse. The windows on the roof, sides and the door are all made from shatterproof styrene so if you have kids, you have no worries of broken glass being everywhere. The cladding used along the bottom is 12 mm thick tongue and groove shiplap cladding and it has a fantastic look, so as well as keeping out the rain it is one of the most eye catching features of the structure. Keeping the whole greenhouse together is a very impressive frame made from softwood. 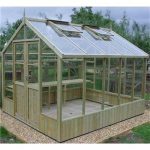 The Windsor 84 Wooden Lean-To Greenhouse is a very smart looking lean to greenhouse that is ideal for those of you who want a little space to grow your own and potter around taking care of your plants. We also find that if you are pottering around in a greenhouse, looking busy, your other half and the kids tend to leave you alone which is an added bonus. For a lean to this is actually a pretty decent size with the depth being 4 feet 4 inches and the width 8 feet 2 inches, so you do actually have a good amount of room to move around in the greenhouse. The headroom provided actually surprised us a little bit as at the front you have 6 feet of headroom which goes all the way up to 6 feet 9 inches at the back. So you are not going to have to be hunched over when spending time in here. We really like the roof that they have used here. It is of course an apex style roof and it has quite a sharp slope so the rain is going to run right off it. The roof is mainly made with styrene, but they have this lovely framing that we feel just gives the lean to greenhouse a little bit more personality. One big bonus of this greenhouse is that it actually has an opening roof vent that is included as standard. This is a great touch and a good way to let a little fresh air in here during a hot summer’s day. Some greenhouses have the glass go all the way to the bottom with only a frame keeping it all together, but there is actually some very smart looking cladding used here along the bottom of the greenhouse. 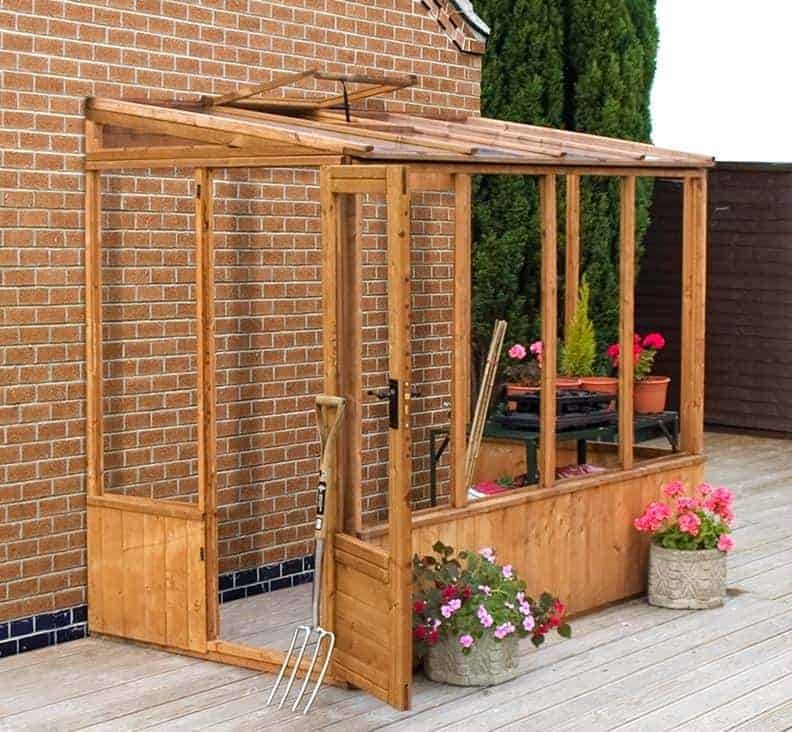 The Windsor 84 Wooden Lean-To Greenhouse has some very smooth looking tongue and groove shiplap cladding which we feel makes this a very eye catching structure. This cladding is 12 mm thick so it is just as strong as it is easy on the eyes. 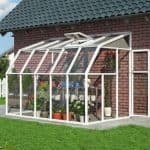 For us, the make it or break it of a lean to greenhouse is the frame. They have a softwood frame that is 45 mm x 27 mm in its size. This does make it a very robust structure and we are sure you are going to be very pleased with how strong it feels. We are pleased they used a thick frame as it should result in this lasting many, many years. There is no floor included with this and to be honest we are really not that surprised. Getting a floor with a greenhouse like this is actually very rare. Most of the time they make you pay for it as an extra and there is not even that option with this. Honestly as long as you have concrete floor or even perhaps some decking, you are going to be fine with this. A basecoat treatment is applied to the Windsor 84 Wooden Lean-To Greenhouse and this is ok for short term protection. But you will need to give it a good coating of wood treatment shortly after you have installed it to give it the best start to its life. Treatment is something that should be done once a year. You take care of the wood and you are easily going to get 20 or more years out of this. 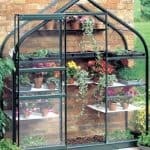 Windsor do give you a very generous 10 year warranty with this lean to greenhouse and that is great. But we must make it a point to mention that this warranty is only valid as long as you are taking care of the wood properly. We just love the door that they have used on the Windsor 84 Wooden Lean-To Greenhouse. It is a single door, but they have made it very well. It has a very strong frame, with some good looking hinges. This means the door is very strong and will not become weak or flimsy. A key operated lock is included as standard and the door handle is done in an old timey kind of style. Of course windows are going to be a huge part of any greenhouse and this one is no different. 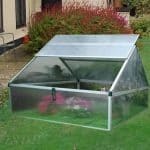 The windows on the sides, roof and doors are made with styrene which should allow the heat to really get inside the greenhouse and help your food and plants grow. We know that some would prefer some kind of toughened glass, but we feel that styrene is better for those who have kids playing in the garden as there is no danger of broken glass. You can only get so much security with a lean to greenhouse. But this one does have an actual lock and key included with it so you can keep people out and stop them stealing your strawberries. Also, the air vent in the roof can securely close as well so there is no way any squirrels, birds or velociraptors can get in through there. You are never going to get a ton of security with a greenhouse, but we are pleased with what this one offers. The windows make up a large portion of this lean to greenhouse so of course privacy is limited, but as the bottom of the structure is fully cladded you could always hide a few things along here. The best way to give this a little bit of your personality is if you treat the wood with coloured wood treatment. They do actually offer wood treatment in a variety of colours. Red Cedar, Dark Brown, Light Brown and Ivy Green wood treatment can be purchased for £14.99. As well as the different coloured wood treatments there are another couple of extras available for you. They offer an installation service, but at £159.99 we feel is a wee bit on the pricy side. They also have a basic tool kit which can be purchased for £44.99. This is a good tool kit, but if you are purchasing a lean to greenhouse then we would assume you have a half decent tool box already. We are very impressed with the design of this greenhouse. In general there is nothing that made us question the quality and we feel they have really done a great job with this. This has been designed to last and that is most evident in the thick frame they have used. While it may be strong structurally. You are going to have to look after the wood with a coating of treatment once a year. At a little over 8 X 4 this is a very decent sized greenhouse. You are certainly going to be able to fit a few tables, shelving and yourself in here without any issues. You are going to have to talk a friend into helping you out. But this is a very simple DIY job and we do not see this taken you more than 2-4 hours. Even the three stooges would have this together in a few hours. We know that just under a thousand pounds is no small chunk of change, but we feel that the size and the general quality make this a very fair price. 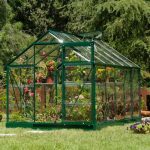 Final Thoughts: The Windsor 84 Wooden Lean-To Greenhouse is a very smart looking greenhouse that has a great design. We are very impressed with this and even at the slightly high price, we feel it is offering very good value for money. You have plenty of room inside this lean to greenhouse which is not something a lot of them provide, so you are really going to have a lot of fun inside here taking care of your plants, growing some very tasty food and of course telling the kids or grandkids to stop playing football near it. In all this is a fantastic greenhouse and one that honestly, we have no major issues with at all.